Foam pumpkins are an alternative to real ones for your Halloween carving tradition and can be saved to use next year. This is a guide about carving foam pumpkins. Each year my husband adds a couple of carvings to his collection. We light the pumpkins each evening during the month of October. I really wish all of you could bring your children and grandchildren by to see them. Michaels and many other stores sell carvable pumpkins. Get one for each of your children or grandchildren. Let them carve them, have them sign and date the bottom. In a few years, you will have a fantastic collection of carvable pumpkins showing their skills. What a fantastic memory for the family! Enjoy! These are our current crop of pumpkins. Each year, my husband adds eight to the collection. We purchase your carvable pumpkins at Michaels. Remember they have the 40% off coupons! Sometimes they are on sale. Free patterns and stencils are on-line at many sites. Just google free pumpkin patterns. We generally gets a pattern book at Michaels. It includes all the tools you will need. Use a push pin to punch the pattern onto the carvable pumpkin. 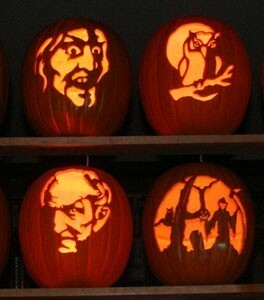 After carving the pumpkin, trace around a quarter coin on the bottom back of the pumpkin and cut a hole for the light. The dollar store carries the single bulb light with the cord. They are for the porcelain Christmas houses. 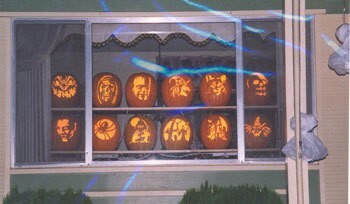 We use a timer to display the pumpkins in the morning for the commuters and the evening. Each pumpkin is stored in an individual box throughout the year. 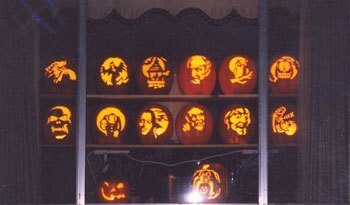 It may seem like a lot of money invested, but you only carve once and many of our pumpkins are over ten years old. 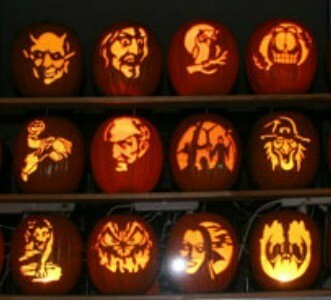 As we are nearing Halloween the little light bulb in the pumpkin is sure to burn out before the big event. 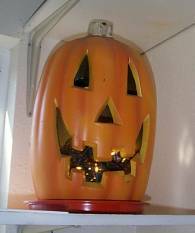 Rather than run all over town to find a replacement for just a few days, I just thread a string of clear Christmas tree lights through the back/bottom of the pumpkin for the remainder of the season. It is safe and easy.